joined the Practical Preservation podcast to discuss his epoxy system, preservation contracting experience and services, plus his window evaluation program of surveying, documenting, and providing recommendations to building owners. John Stahl started his career working on a historic property in Salt Lake City while attending college. John moved to New York City and began a small painting and building restoration company. In 1992, John began a long relationship with This Old House Television show demonstrating wood and wood window restoration. John also worked on several articles for This Old House Magazine. John assisted Sanford University in surveying and developing a detailed scope of work for the restoration of 1300 windows and doors at their historic Main Quad. John is the owner and product developer for Next Generation Systems located in Altamont, New York. Contact information for Alison plus additional resources: Alison Hardy – Window Woman of New England 978-532-2070 https://windowpreservationalliance.org/ Bio: Alison Hardy is owner of Window Woman of New England, Inc. Her company restores windows in the North of Boston/Merrimac Valley region. Alison has a BA from Denison University and an MBA from Boston University, only some of which is useful when scraping paint. When not restoring windows for other people she works on restoring her 1850’s farmhouse in Topsfield, MA. Transcript: Speaker 1: Thank you for tuning in to the Practical Preservation podcast. Please take a moment to visit our website practicalpreservationservices.com for additional information and tips to help you restore your historical home. If you've not yet done so, please subscribe to us on iTunes, Stitcher, and Sound Cloud. Also like us on Facebook. Speaker 1: Welcome to the Practical Preservation podcast hosted by Danielle Keperling. Keperling Preservation Services is a family owned business based in Lancaster, Pennsylvania dedicated to the preservation of our built architectural history for today's use, as well as future generations. Our weekly podcast provides you with expert advice specific to the unique needs of renovating a historic home. Educating by sharing our from the trenches preservation knowledge, and our guest's expertise balancing modern needs while maintaining the historical significance, character, and beauty of your period home. Danielle: Thank you for joining us for the Practical Preservation podcast. Today, we have Alison Hardy. She is the owner of Window Woman of New England, Incorporated. Her company restores windows in the north of Boston Merrimack Valley region. Alison has a BA from Denison University and an MBA from Boston University, only some of which is useful when scraping paint. When not restoring windows for other people, she works on restoring her 1850s farmhouse house in Topsfield, Massachusetts. Alison, thank you for joining us. Alison: Thank you for inviting me, Danielle. Danielle: Thank you. I know that we have met in person a couple of times, so I'm excited to have you here to share your knowledge and expertise. How did you get started in preservation? It kind of sounds like it was a meandering road, similar to mine. Alison: Indeed, this is about my third career. I actually trained to do textile design and costume design and did that for many years, and sold large format printers for printing textiles. Then when my husband and I bought an old house, suddenly like most people in preservation, you start looking at your old house and appreciating your old house and getting interested in old houses. It really came about from owning a wreck of a house with windows in terrible condition. I said, "This is crazy. I must be able to fix these somehow." Danielle: Very good. Did you start at restoring your windows yourself? Did you learn yourself or did you take some classes? How did you figure out what you needed to do? Alison: I am self-taught. Luckily, my husband builds furniture as a hobby, so he had a wood shop which was very handy. Then I am one of those people who will just go out and research a project to death, so I read as much as I could, went to some events on preservation and talked to as many people as I could, and just started chipping away at paint and figuring out how to re-putty a window, which is daunting at first, but after you do a couple hundred you get really good at it. Danielle: Right, we joked that people, if they're going to try to do it their selves should start in the back of the house. Alison: Definitely, definitely somewhere you don't want to see. In fact, the house that we're in now, the first windows that I did are embarrassing. Danielle: Oh no. Alison: They're my walk of shame every day. I'm like, "Oh, I really should redo those," because I just didn't have the patience for getting all of the paint off and doing all of the repair techniques that now we do. Danielle: Right, and the little details do matter. We try to impart that, too, to our employees. That, just because you're scraping paint doesn't mean that that's not one of the most important things that you're doing on this window. Alison: True, and it's funny, we just had a batch of windows come in that had been scraped by an abatement company, and my crew was horrified at how badly they were done. I'm like, "Well, that's why we insist on being neat and tidy and doing things so that you don't harm the window, you actually make it better." Danielle: Yes, yes. Important lessons. How did you get started then selling your services to the public? Alison: Well, funny enough, a friend of ours bought an apartment building in a town not far from us and said, "It's got a bunch of windows in horrible shape. Do you want to tackle those?" I thought, "Sure, why not? I'll give you a hand." Which, turned out to be a huge project. I've never seen so much nicotine on a window in my life. That was sort of the cutting teeth to, yes I think I can do this for other people. Alison: Then, you know, God bless America, you can hang out a shingle and start a business. That's pretty much what I did and started off with some projects for friends, and then those friends knew other people. The good thing about the old house world is that they all talk to each other about products and services and suppliers. Luckily the word got out quickly. Danielle: Right, that's one thing I've noticed too is that, people are very willing to share their knowledge and information, which is very helpful. You know, even contractors and crafts people, they will share the information because it's not, even though you might be a competitor, everybody is working towards the same goal. Alison: It seems like once you find people who cherish older houses and older buildings, we want to support those businesses and we want to let other people know that this is a contractor or somebody who gets old houses just like we do, instead of the "rip them apart and make them into planned cottages." Danielle: Yeah, that kind of takes us into my next question. Why do you preserve windows? What makes you passionate about this? Alison: I do so many estimates now, and it's always amazing to me the condition of older original windows. You know, to somebody who's not as observant as I am about windows, they may look terrible. The paint's peeling, the glazing's falling off, but to me, I'm like, "But look at the corners and the joints. They're still in really good shape. They're still beautifully built. They're still serving their function. They fit the building. If we just do a little bit of repairs to them, they'll be beautiful again." It's exciting, because most people who call me in kind of know that in the back of their mind, so it's a validation of saying, "I thought they looked pretty good." I'm like, "Yes, they are really good. Let's save them." Danielle: Yes, you don't have to listen to the person that told you, you just need to get new windows. Alison: Right, I always use the analogy, if you got a flat tire, would somebody say you had to throw out the car and get a new one? It's the same thing. You have a broken sash, it's not the end of the world. It can be fixed. Danielle: Right, right, very, very true. Since you kind of have been learning as you go, what do you wish that you knew when you started that you know now? Alison: I think if I had any idea how much time was required for doing windows, I probably would have been terrified. You have to acknowledge that it's a very labor intensive process and there's not many shortcuts. If you do take shortcuts, it usually ends up costing you in the long run. I think if I really had thought about how much time was involved, I probably would have had a different idea. Danielle: Yes. That's true, and that's one thing that I've been trying to explain to people. The majority of our cost is labor. We're paying people to do this work. Alison: Yes, glass isn't a big of expense, wood isn't a big expense, it's just the people. Danielle: Right, right. Have you made any major mistakes that you're willing to make a public confession about? Alison: I think undercharging in the beginning made my life a lot more difficult. Once you start charging fairly, your life gets a little bit better. Danielle: That is really true, and from a business standpoint, that's I think pretty typical for people who, especially are doing the hands on work, they do undervalue the contributions that they're making. Alison: It's true. It's hard to believe that people don't really know what kind of value and cost to assign to window repairs. They know what replacement windows cost if they've been shopping around, but they really don't know, and so it's up to us to give a fair price. That we know how much time it's going to take and we know what we need to do to get it done right, and it's going to cost. It's not a cheap process. We try to be as efficient as we can, but at the end of the day it's still labor hours. Danielle: Right, yeah. Alison: I have to say, yeah, the other big mistake that I am always teetering on the edge of is I got asked to look at a project and the client said, "Well, you know, I had your competitor work on my last house and I don't want to have them back." I get all puffed up and go, "Yes, because we're better." It turns out that that's a very bad mistake, because they're usually very bad clients. I've learned to not get my ego all puffed up and think that we're better than the other guy. No, sometimes they're just bad clients. Danielle: Yeah, and that's true. Sometimes you do have to kind of see those warning signs and see how the development process goes before you make a commitment to them. Alison: Yeah. Danielle: What is the biggest challenge that you see in preservation, or even just in your corner of preservation? Alison: I know, my very tiny corner of windows. Really, the hard thing is awareness. I can't tell you how many times people say, "I had no idea anybody did this type of work. I had no idea anybody did this type of work." It's frustrating because we don't have the big advertising budgets of the large replacement companies. We're very small voices out in the world and it's hard to get the message out there. I think that's why we're so grateful to word of mouth, is that that's the most efficient way we can to spread the message, but it's slow and painful and there's nothing worse than finding out that somebody replaced their windows unnecessarily because they just had no idea that they had an option. Danielle: That's very true. We're fighting the mentality of the past 50 or 60 years of being product installers rather than crafts people too, and looking at it as something that's repairable rather than just having to replace it. All of that has been pushed by advertising. That is a very big challenge within preservation. Alison: I think we all sort of cringe at the TV shows that people just take sledgehammers to buildings without even stopping to think about it, or at least not on camera they stop to think about it. It's so maddening as a preservationist. You know, "Why are they just taking it down in the most destructive way possible? You can take a cabinet off a wall without having to take a sledgehammer to it." It just drives me crazy. Danielle: Right, it wouldn't be as good TV. Alison: Yeah, right? Danielle: Do you see any trends in preservation? Any maybe glimmers of hope? Alison: You know, I have been doing some estimates recently for young couples who are buying their first house and I keep hearing this, "I want to do it right. I want to be real. I grew up in a house with vinyl windows, I grew up in a house with vinyl siding and I don't want my children to grow up in that kind of house." I think this whole makers movement, you know, people wanting to get their hands dirty and to do projects and to build things is very encouraging, because once you do get your hands on something, then you start to appreciate it more. That, to me, has been exciting to hear people talk about they want to save things instead of throwing them away. I'm like, "Thank you, finally we're getting to that point where we understand how bad all of the debris we create is." Danielle: Yes, yes, and I think it is values and it's a mentality because I'll even take shoes to get fixed and clothes to the tailor. It is, it's a different mentality of you don't have to just go out and get new, you can fix what you have, especially if you have a good quality. Then it's really not more expensive, because you're not paying it over and over again. Alison: Right. We've had great success of going to some of the green fairs, even a lot of events that focus on local and sustainable foods, because that same mentality carries forward into your house. If you don't want to eat fake food, why do you want to have fake windows? There's a continuum here that it all sort of makes sense. Why would you want to create acres of trash and then demolish parts of your house unnecessarily? It all kind of goes together. Danielle: It does, yeah, that's very true. How do you keep up with trends in preservation? Alison: I love to go to events. I think that's probably the hardest thing for a lot of people who are working in the trades, is that they don't have big travel budgets and they can't get out to things. Making an effort to go and meet with fellow preservationists, we just had a wonderful meeting in Valley Forge, Pennsylvania in February with the Window Preservation Alliance. This is a trade group that was formed two, three years ago now to bring together window restorers to raise awareness of window restoration, that we actually got started because there was a preservation conference that had one of the big replacement window contractors as a sponsor. Danielle: Oh, yes. Alison: We said, "This is crazy. How can we represent our side of the argument when we don't even have a seat at the table?" The Window Preservation Alliance, we're a trade association so we now have funds so that we can sponsor events so that we have the other side of the argument, we're at the table so that we can be part of those discussions. It's exciting how we're finding more events, we're helping to sponsor events. Alison: There's one coming up in Cincinnati in May that I'm going to where we're going to be restoring windows in two buildings. There is one in San Antonio coming up. Then in September in Detroit the Preservation Trade Network will be putting on an event too, so I'm excited about the number of opportunities that we have to meet with one another and talk about what we do. We're kind of an obscure little profession here, and it's nice to meet other people who know what you're talking about. Danielle: Yes, and that's exciting that you're going all over the country. I wouldn't necessarily think of restoring windows in Texas. There are buildings there that have windows to be restored, so that's going kind of off of what people would necessarily would think about would be where the historic places are. Alison: It's nice that they are people who do this for a living mixed in with community people, because a lot of times homeowners do want to learn how to do things, how to get involved, but they don't necessarily want to tackle the whole project. As my colleague Steve [Coullion 00:16:23] calls it, "The pros and the Joes working together," we get a lot more done in a short period of time. Danielle: Yeah, very, very exciting. That also helps build awareness in the community that there are other options. I know my mom used to sit on the Historic Commission here in Lancaster City, and people would come in wanting to put vinyl windows in, and they would say, "Well, there are other options," and people would say, "No, there aren't." Then it's a whole education process. That's a way to do it before even those decisions are being made. That is very, very exciting. Do you have a favorite resource? Alison: Since May is preservation month, last year was the first year we tried to get all members of the Window Preservation Alliance to hold an event for preservation month. We did one called a sash revival, so we encouraged people to bring in their windows, which most of them have broken glass, and we showed them how to cut glass, fit glass, and glaze a window. It was a really fun event. My crew had a great time working with people. Most of them came from the next town over, which has a fabulous collection of old houses. Alison: There were actually events all across the country and we're hoping to do that again this year in May. We had everything from, they did a driveway pop up, they just put a tent in their driveway and had people work on glazing windows. Somebody had a booth at a farmer's market talking about window repairs. Then some people like me opening up their shop to have the public come in and learn more about what we do and actually get their hands on a window. It's really fun to have events like that to, again, trying to raise awareness of what we do. Danielle: Yes, that sounds like fun. To tie it into the national trust, making their whole push for preservation too for that month, it helps build awareness on multiple fronts, so I think that's really great and exciting. I'm kind of sad that I didn't think of it. Alison: Some days you just have, and again, a lot of times it's just hanging out talking to our other fellow window restorers going, "How can we do this?" Danielle: Right. Alison: "Well, what if we just had people bring in windows?" Danielle: We've even had classes before, but we never had people bring their own windows in, but that makes so much more sense. Then they leave with something that's done. They don't have to go back and kind of tackle it themselves. Alison: I was trying to do the sad face/happy face as people came in and left, but I didn't do so good at capturing my photographs. It was nice to be able to have something they accomplished in one day. Danielle: Yes, yes, yes, and it makes it a little bit less daunting I would think for them. They know that they can at least, if a pane of glass breaks, they know that they can fix that and it doesn't take all day. Alison: Right. I think we've all had the frustrating experience of trying to get glazing putty to look neat. We've got a couple tips and techniques that we can show people to get them over that frustrating stage of, "It's just all goopy and it keeps pulling up and it makes a lumpy mess." Danielle: Right. Alison: I don't know what to say. We'll help you. Danielle: This will make it easier. Alison: Right. Danielle: What do you think makes you different from other businesses that do this work? Alison: You know, I'm finding there's more similarities than dissimilarities in what we do. We've become one of the larger shops. I have 10 employees, and so we're able to tackle bigger projects. I think we're also fortunate that in the Boston area there are a number of window restoration shops, so if we have a really huge project, we can divvy it up and all work together. It's very much a collaborative type of business, which is great. It makes it much more fun than being a competitor. Danielle: Right, yeah, I definitely agree with that. Okay, well thank you so much for joining us today. Why don't you let us know how our audience can get a hold of you. Alison: Probably the best way is through our website, which is window-woman-ne.com. There is a contact us page which has our email address on it, or you can always call the workshop at 978-532-2070. Danielle: Very good, thank you. Speaker 1: Thanks for listening to the Practical Preservation podcast. The resources discussed during this episode are on our website at practicalpreservationservices.com/podcast. If you received value from this episode and know someone else that would get value from it as well, please share it with them. Join us next week for another episode of the Practical Preservation podcast. 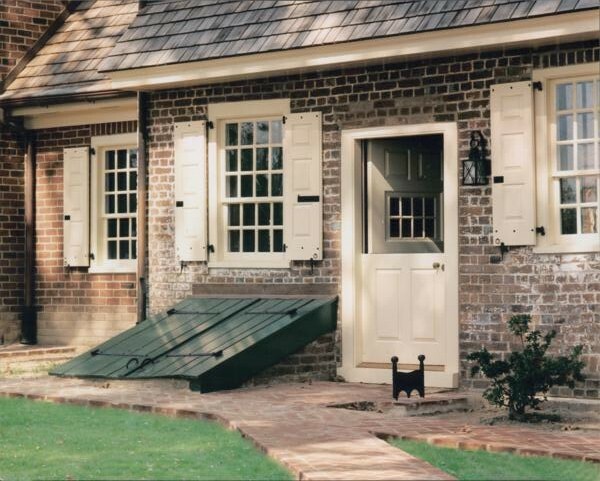 For more information on restoring your historic home, visit us at practicalpreservationservices.com. We recently completed a historic wood window restoration project at the Mill at Anselma. This mill is a gem of historic architecture in our country - the most complete example of a functioning historic grist mill in the entire country. The Mill at Anselma has truly historic origins. In the late 1600’s, the property was owned by Pennsylvania’s founder William Penn, though there was no mill on the property just yet. That would come in the mid 1700’s when influential Quaker Samuel Lightfoot decided to build a water-powered mill along the Pickering Creek after purchasing the 500-acre property in 1725. In the mid 1700’s, Chester County was becoming the “bread basket” of the colonies and Lightfoot recognized the need for a local grist mill. In 1767, Samuel divided his property between his two sons, with his younger son William receiving the acreage that included the grist mill. It was during William’s old age that the mill’s prosperity began to decline. It wasn’t until the early 1820’s that the mill would be revitalized when revolutionary technology that allowed for continuous production in grist mills was installed by the Shenemans. These labor-saving elevators and conveyors carried the grain between floors in the mill and were incorporated into the existing mill system – leaving the original Lightfoot technology untouched. Just before the Civil War, the Oberholtzer family purchased and lived on the property and in 1862 poetess married into the family. The scenery around the mill is featured in her poems, including her famous “At the Old Mill” from her book of verse, “Violet Lee”. The mill remained largely untouched until 1906 when the wooden water wheel was replaced with a steel water wheel and the wooden sluiceway with iron pipe. Shortly after, the advent of portable grist mills made trips to the Anselma Mill no longer necessary and the mill’s prosperity quickly declined. In 1919 Oliver Collins purchased the property and responded to the changes in market demand. Without touching the Colonial-era technology in the mill, Collins installed technology that allowed him to run a grist mill, saw mill, cider press, metal working shop, and even a barber shop and lawnmower repair shop – all of which were powered by the water wheel in the mill. In 1982 when Collins passed away, the Mill was purchased by the French and Pickering Creeks Conservation Trust, who performed a lengthy restoration of the mill from 1999 to 2004. When done, the historic millstones milled flour for the first time since 1934. It is the most complete example of a custom grain mill in the U.S. and in 2005 The Mill at Anselma became the only custom grist mill in the U.S. to be designated a National Historic Landmark. During the restoration in the early 2000’s, the deteriorating window sashes had not been addressed and we were contracted to repair and replace the window sashes and sills. Before we began work, the windows were a hodge-podge of different styles from different periods over the years. None of the sashes were original to the mill, so we replicated the profile from the oldest sash on the mill to give all the windows the same profile. We manufactured new sashes for the windows, replaced a few sills, and repaired quite a few stops and casings to restore the windows to full, working order. In deciding which wood to use for the windows, we looked to the wood that was already on the mill. We determined that the window frames had originally been made of white oak and had been left unpainted, which was common for informal Colonial buildings. So we chose a quarter sawn white oak for the replacement sashes. In quarter sawn white oak all the graining runs vertically. This makes the wood a tighter wood that is stronger and more stable since the grain is all running in the same direction, is less prone to warping, and seasonal expansion and contraction, and offers extra moisture resistance. Quarter sawn white oak in general is a quality wood choice, but it was a particularly ideal wood choice to use in the moist, shady area of where the mill sat. Though we don’t often leave wood unpainted, we did in this case in keeping with the original style of the windows. Despite the fact that originally there would have been no treatment applied to the wood, we did use a preservative that we made out of linseed oil and mineral spirits to help protect the wood and increase its longevity. The new growth wood we have available to us today simply does not last as long as old growth wood did when left untreated. In addition to our work on the windows, we repaired the roof on their springhouse. During a winter storm a tree had fallen on the springhouse and damaged the roof. It was a traditional oak lathe roof with no sheathing and had bellied down in the center. When it was restored, the Trust chose to leave the belly in the roof as a sign of how it had always been instead of correcting it. (A choice that nags at Chuck’s perfectionist side, but one his preservationist side very much respects.) The roof repair required special attention to detail. The angles had to be shimmed and straightened with shingles. “It took more time, but the job wouldn’t have turned out as nice without it. It was definitely worth it,” Chuck notes. [sws_blockquote_endquote align="left" cite="" quotestyle="style01"] “We’re very pleased. It was a real pleasure to work with you and show off your magnificent work. You are outstanding professionals and experts in your field.“ -Craig Hadley, Executive Director Mill at Anselma [/sws_blockquote_endquote] 1 Wood windows are an integral part of the innate energy efficiency of historical buildings. If we have learned anything from history it is that sometimes with all our modern advancements we do ourselves more harm than good. Advancements in technology do not always produce better results, and construction technology isn’t exempt from that. Built in a time of readily available building materials and energy sources, modern building designs typically make poor use of both. Historical buildings were built when neither was in abundant supply and early designers made the most of building materials and design options to construct buildings with a powerful combination of harnessed natural resources and innovative design that worked together to maximize energy efficiency. Everything from exterior paint colors, to locations of balconies, to numbers and placement of windows, to physical placement of buildings on lots was carefully considered to maximize heating, lighting, and ventilation in traditional construction. [sws_red_box box_size="630"] The results are astounding and studies have shown that properly restored and maintained 18th & 19th Century buildings can be just as energy efficient as new construction, and in many cases even more energy efficient. (Perhaps not surprisingly, studies have also shown that buildings built in the 1950’s through the 1970’s were the biggest energy consumers of all.) [/sws_red_box] The historical wood windows in your building contribute to that energy efficiency and, contrary to urban legend, new replacement windows are not more energy efficient than historical wood windows. Typically, studies that conclude such a finding have compared new replacement windows with historical windows that have not been maintained or restored, are decaying, and have no complementary energy retrofits such as weather-stripping and storm windows. If you would like to read these studies, you can access them in the resources section of our website. Studies on energy efficiency also usually fail to consider “embodied energy”. Embodied energy represents the energy it took to manufacture a product. They say the greenest building is the one already built when you consider this embodied energy – an existing energy investment that will never be able to be recaptured once you destroy the product it’s embodied in. If the greenest building is the one already built, then the greenest window is the one already there. Historical wood windows have an embodied energy value that includes all the energy from harvesting and milling the wood to transporting and manufacturing the windows to installing them in your historical building. Preserving existing windows conserves that embodied energy and reduces the use of additional energy when making replacement windows. Which means that when you take all energy, energy expended on heating and cooling costs as well as the embodied energy, into consideration for defining the energy efficiency of windows – historical wood windows are far more energy efficient than replacement windows . Even if you decide I'm too long-winded, or that I'm preaching to the choir, to read this entire post - MAKE SURE YOU SCROLL TO THE BOTTOM to get your free copy of a report on how to make wood windows last for generations we recently wrote. Why Save Historic Wood Windows? These features and variances can be difficult to duplicate with modern technology. Our manufacturing and installation process is significantly different than the process used hundreds of years ago and the characteristics modern machinery and installation techniques impart create an entirely different window than the traditional building methods created when your building was originally constructed. Such a loss of historical elements is a permanent scar on your historical building. 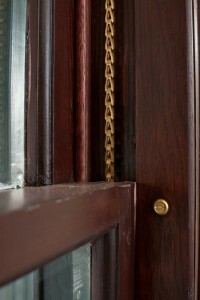 Replacing original wood windows also often requires changing the window’s rough opening to install a window manufactured on national standards in to the non-standard opening of a building constructed during a time when there were no building standards – another mistake that permanently damages your building. 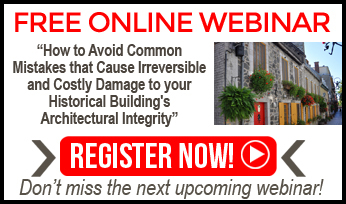 Now that you know how important your historic wood windows, we want you to have the knowledge you need to save them. Get your free copy of our recent report "Put Replacement Windows to Shame: 10 Tools to Make Your Historic Wood Windows Last for Generations"
We recently completed a historic wood window restoration project at the Mill at Anselma. This mill is a gem of historic architecture in our country – the most complete example of a functioning historic grist mill in the entire country. colonies and Lightfoot recognized the need for a local grist mill. In 1767, Samuel divided his property between his two sons, with his younger son William receiving the acreage that included the grist mill. It was during William’s old age that the mill’s prosperity began to decline. It wasn’t until the early 1820’s that the mill would be revitalized when revolutionary technology that allowed for continuous production in grist mills was installed by the Shenemans. These labor-saving elevators and conveyors carried the grain between floors in the mill and were incorporated into the existing mill system – leaving the original Lightfoot technology untouched. Just before the Civil War, the Oberholtzer family purchased and lived on the property and in 1862 poetess married into the family. The scenery around the mill is featured in her poems, including her famous “At the Old Mill” from her book of verse, “Violet Lee”. The mill remained largely untouched until 1906 when the wooden water wheel was replaced with a steel water wheel and the wooden sluiceway with iron pipe. Shortly after, the advent of portable grist mills made trips to the Anselma Mill no longer necessary and the mill’s prosperity quickly declined. In 1919 Oliver Collins purchased the property and responded to the changes in market demand. Without touching the Colonial-era technology in the mill, Collins installed technology that allowed him to run a grist mill, saw mill, cider press, metal working shop, and even a barber shop and lawnmower repair shop – all of which were powered by the water wheel in the mill. In 1982 when Collins passed away, the Mill was purchased by the French and Pickering Creeks Conservation Trust, who performed a lengthy restoration of the mill from 1999 to 2004. When done, the historic millstones milled flour for the first time since 1934. It is the most complete example of a custom grain mill in the U.S. and in 2005 The Mill at Anselma became the only custom grist mill in the U.S. to be designated a National Historic Landmark. During the restoration in the early 2000’s, the deteriorating window sashes had not been addressed and we were contracted to repair and replace the window sashes and sills. Before we began work, the windows were a hodge-podge of different styles from different periods over the years. None of the sashes were original to the mill, so we replicated the profile from the oldest sash on the mill to give all the windows the same profile. We manufactured new sashes for the windows, replaced a few sills, and repaired quite a few stops and casings to restore the windows to full, working order. In deciding which wood to use for the windows, we looked to the wood that was already on the mill. 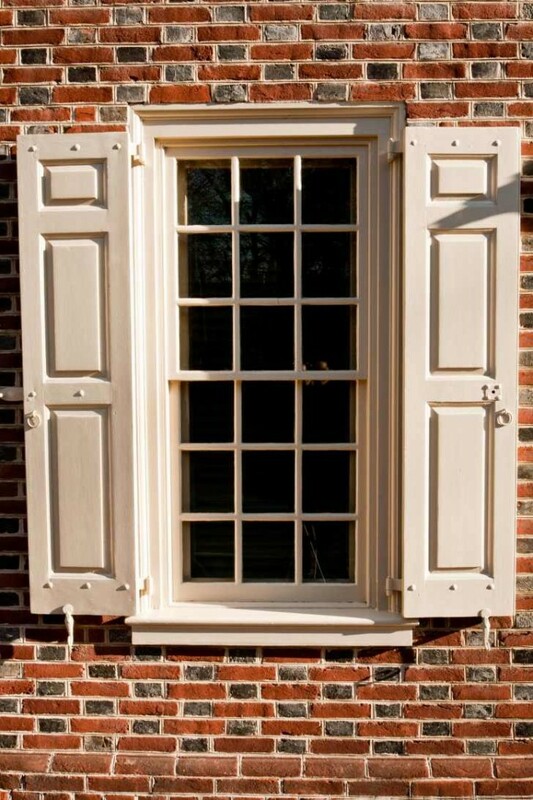 We determined that the window frames had originally been made of white oak and had been left unpainted, which was common for informal Colonial buildings. So we chose a quarter sawn white oak for the replacement sashes. In quarter sawn white oak all the graining runs vertically. This makes the wood a tighter wood that is stronger and more stable since the grain is all running in the same direction, is less prone to warping, and seasonal expansion and contraction, and offers extra moisture resistance. Quarter sawn white oak in general is a quality wood choice, but it was a particularly ideal wood choice to use in the moist, shady area of where the mill sat. Though we don’t often leave wood unpainted, we did in this case in keeping with the original style of the windows. Despite the fact that originally there would have been no treatment applied to the wood, we did use a preservative that we made out of linseed oil and mineral spirits to help protect the wood and increase its longevity. The new growth wood we have available to us today simply does not last as long as old growth wood did when left untreated. The roof repair required special attention to detail. The angles had to be shimmed and straightened with shingles. “It took more time, but the job wouldn’t have turned out as nice without it. It was definitely worth it,” Chuck notes. Wood windows are an integral part of the innate energy efficiency of historical buildings. If we have learned anything from history it is that sometimes with all our modern advancements we do ourselves more harm than good. Advancements in technology do not always produce better results, and construction technology isn’t exempt from that. Built in a time of readily available building materials and energy sources, modern building designs typically make poor use of both. Historical buildings were built when neither was in abundant supply and early designers made the most of building materials and design options to construct buildings with a powerful combination of harnessed natural resources and innovative design that worked together to maximize energy efficiency. Everything from exterior paint colors, to locations of balconies, to numbers and placement of windows, to physical placement of buildings on lots was carefully considered to maximize heating, lighting, and ventilation in traditional construction. have not been maintained or restored, are decaying, and have no complementary energy retrofits such as weather-stripping and storm windows. If you would like to read these studies, you can access them in the resources section of our website. already built when you consider this embodied energy – an existing energy investment that will never be able to be recaptured once you destroy the product it’s embodied in. If the greenest building is the one already built, then the greenest window is the one already there. Historical wood windows have an embodied energy value that includes all the energy from harvesting and milling the wood to transporting and manufacturing the windows to installing them in your historical building. Preserving existing windows conserves that embodied energy and reduces the use of additional energy when making replacement windows. Even if you decide I’m too long-winded, or that I’m preaching to the choir, to read this entire post – MAKE SURE YOU SCROLL TO THE BOTTOM to get your free copy of a report on how to make wood windows last for generations we recently wrote. Did you know that historical wood windows are one of the most vulnerable and “at-risk” elements of our architectural heritage? Despite this, windows don’t often have a high priority on the list of things we should preserve in our built history. Yet they should. If eyes are windows into the soul, as the old adage goes, then surely windows are how we see into the soul of a historical building. 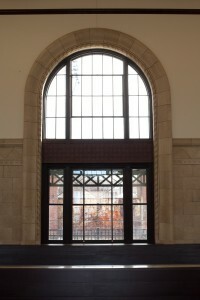 The windows in your historical building are an important contribution to how your historical building looks. Not only are they one of only a few parts of a building that serve as both and interior and exterior architectural feature, they usually make up about a quarter of the surface area of a historical building. Many aspects of windows contribute to your building’s architectural style and historical fabric – height, width, and thickness of frames and sills, the visual design of sash components, the materials and color treatments used, and even the way light reflects off of the glass. Muntins, historical glass, putty beading, moulding profiles, glazed opening widths, and regionally-distinct patterns and features are more distinct characteristics of original wood windows that contribute to your historical building’s façade. And all of these varied between architectural styles and periods and from region to region, making wood windows living artifacts from history – an archeological goldmine that helps us understand and document our historical building practices and craftsmanship. These features and variances can be difficult to duplicate with modern technology. Our manufacturing and installation process is significantly different than the process used hundreds of years ago and the characteristics modern machinery and installation techniques impart create an entirely different window than the traditional building methods created when your building was originally constructed. Such a loss of historical elements is a permanent scar on your historical building. 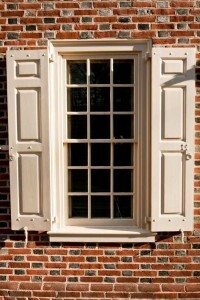 Replacing original wood windows also often requires changing the window’s rough opening to install a window manufactured on national standards in to the non-standard opening of a building constructed during a time when there were no building standards – another mistake that permanently damages your building. Just as we shouldn’t replace our historical art with modern replicas, we shouldn’t replace our historical wood windows with modern replacement windows. Throwing out the artifacts from our built history that stand testament to how our buildings were constructed over the last several hundred years prevents future generations from a deep understanding of a piece of our history that’s just as important as all the other artifacts we work so hard to preserve. Because once they are gone, they are gone for good. Now that you know how important your historic wood windows, we want you to have the knowledge you need to save them.